I’m baaaaack. My goal is going to be one post a week through the end of the summer. For my first post back from hiatus, I have something special for y’all: giant purple alien flowers that smell like rotting flesh! While moving my stuff into the house in Walla Walla (yep, no more rural Oregon), I noticed the unmistakable smell of death. Some small animal had clearly crawled into the bushes, died, and was decomposing. We poked around a bit but couldn’t find the culprit so we didn’t think much more about it for the time being. Not until the next day did we make the connection between the smell and the enormous alien flowers that were blooming in the yard. These things are wild. We’d been watching them grow all spring without being sure what they were; they started as tentacle-like spikes sprouting from the ground, then developed the pretty green-and-white striped foliage you can see in the picture, and finally grew enormous two-foot-long buds like alien pod things. Then the buds opened into spectacular, death-scented flowers. 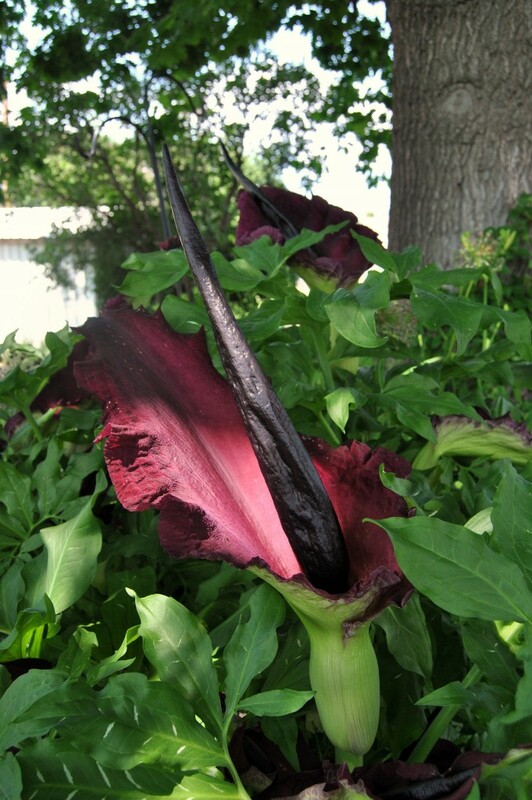 Turns out that this plant, Dracunculus vulgaris, is native to the Balkans and has variety of expressive common names like Voodoo Lily and Black Dragon. 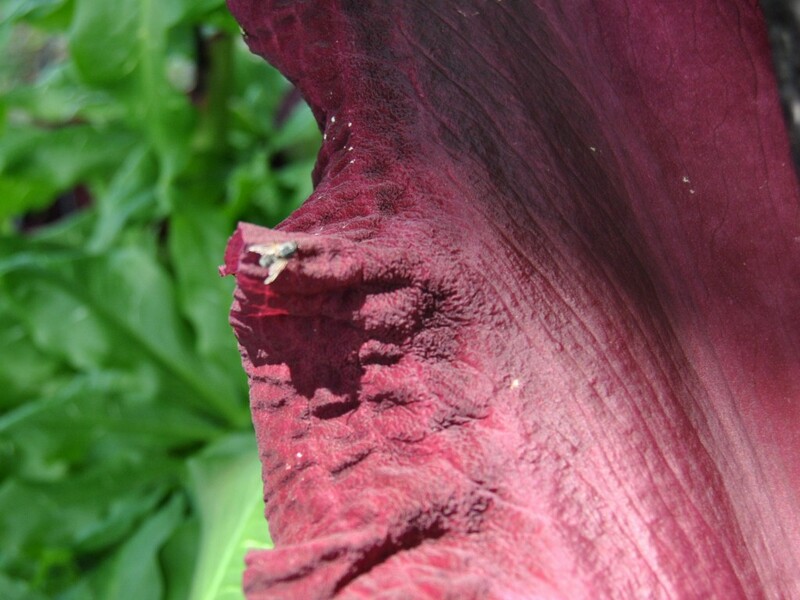 It is (of course) pollinated by flies, which it attracts by mimicking the color and smell of a rotting corpse. In fact, there was a cloud of flies buzzing around the flowers when I was taking photos, although I had trouble getting one in focus. The first spring in a new house, when you don’t really know what sort of plants are in the landscaping and every new thing that sprouts is a mystery to solve, is a lot of fun. According to the internet, the rotting flesh smell of our Voodoo Lilies should only last a couple days. We like our weird purple alien death flowers and can’t wait to see what strange thing appears in our garden next. I spent Wednesday through Friday of last week canoeing the Willamette River over on the coastal side of the state (for work – yes, be jealous). Marked on the map of one of the state parks we camped at, Willamette Mission, was the nation’s largest black cottonwood tree. Who could possibly resist? I wish I’d had more time to take better pictures and enjoy it properly, but alas, we were only passing by. Still, it’s always fun to encounter a giant. Back in Wisconsin, aspen suckers grew like weeds after an area was logged. It came as a surprise to learn, when I moved out West, that here aspens are in serious decline and the focus of conservation efforts. Above is a stand that we’re going to be building a fence around soon at work, to protect it from damage from cattle, deer, and elk. It’s doubtful that elk actually spend much time in this pasture anymore (though they’re definitely around in the hills), but the dark scars on the trunks of the trees come from elk scraping at the bark with their teeth to get at the nutritious, photosynthetic layer of bark under the white outer layer. While aspen trees do produce flowers, most of their reproduction is vegetative, in the form of new shoots or “suckers” growing from existing root systems. Young, tender suckers are super tasty food for deer – the ones in the photo above, growing in the shelter of a fallen adult, have been heavily browsed. Fencing the deer out of the stand will help young trees get established. The way suckering works is actually pretty interesting – the crown of the tree produces a hormone called auxin that inhibits the production of suckers. When the tree falls and auxin is no longer produced, the growth of new suckers increases in response to keep the stand going. An aspen stand is really one big organism, interconnected by the root system that keeps on living even as individual trees die and are replaced. One particular aspen clone in Utah is a candidate for the world’s largest, oldest organism. Are Wolves Saving Yellowstone’s Aspen Trees from Elk? Earlier in the season these shiny green leaves would have been complemented by clusters of big, showy pink flowers, but by this time of year all that remained of those was the developing fruits. Second, ripe huckleberries of both the blue and red varieties – yum! These are two different species in the genus Vaccinium, which also includes blueberries and cranberries. Nothing beats being able to stuff your face as you walk down a trail, amiright? Juniper trees are the nemesis of many ranchers around here. As a result of the region’s altered fire regime – no more wildfires sweeping through and keeping trees from establishing themselves – Western Junipers (Juniperus occidentalis – I like literal Latin names like this) are encroaching more and more onto rangeland, sucking up water with their taproots and outcompeting understory plants. 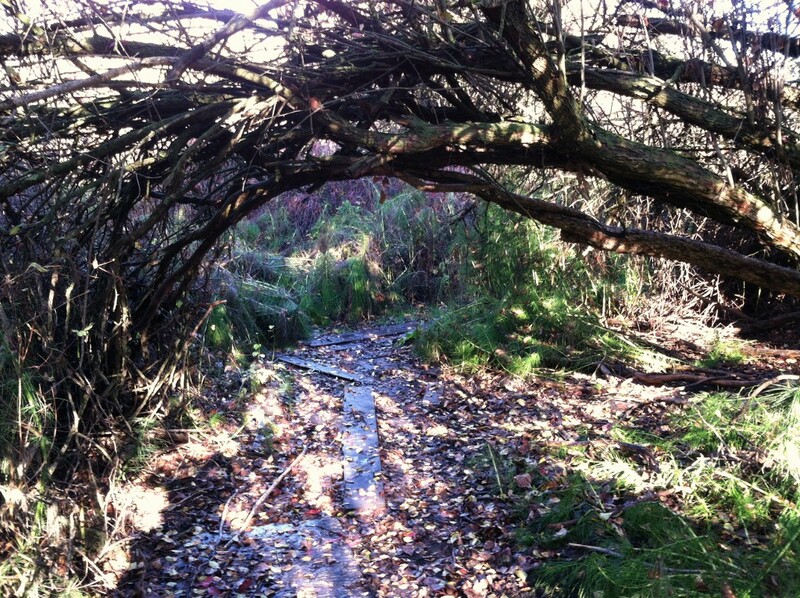 But the truth is, I kind of like ’em, these tough, scrubby little trees. They’re survivors. And they’re not an exotic invasive species – they were always here, it’s just that now there are even more of them, in more places. The female cones don’t look like cones at all, but like fleshy little silvery-blue berries. They’re an important food source for fruit-eating birds like robins and waxwings. They’re also where the flavoring in gin comes from. Someone I met at a conference recently told a story about mistaking a bag of juniper berries her boyfriend had left in their freezer for blueberries and baking them into a pie, but I wouldn’t recommend trying that at home. The rugged individuals of the tree world. Really, they fit right in around here. And since me secretly liking them won’t actually change whether efforts to eradicate them from rangeland are successful, I’m going to go right on doing it.